When Facebook launched the 2.0 version of its iPhone app in September of last year, it was a huge upgrade from its original app that launched with the App Store last July. And now it’s on the verge of launching the 3.0 version of the app, and having tested it today, we can safely say that it once again takes Facebook on the device to the next level. In fact, it may be the most useful app on the iPhone now, period. This new version simply improves upon the old one in just about every way imaginable. Not only does it have a wide range of new options and features, many of which we went over previously, but it’s actually faster. And the design is rather brilliant. Built by Facebook engineer Joe Hewitt, the app manages to maintain the good practices found in many iPhone apps, while at the same time creating its own unique look and feel. 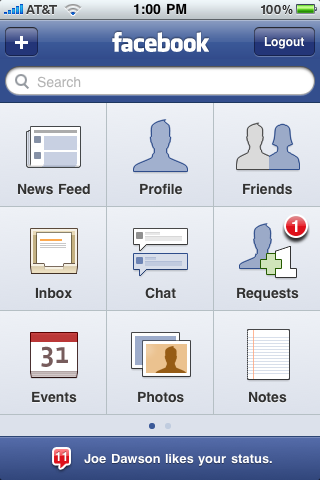 Nowhere is this new look more evident than on the new Facebook home screen. It’s sort of like the iPhone main screen, but with a different, distinctive design. The large buttons are easy to hit, and best of all, you can add people’s profiles and pages as icons as well, to provide shortcuts to your favorites. The main screen that you were probably used to from the old app now resides in the upper left corner of the main screen, as the “News Feed.” It largely looks the same but the ability to “like” items has been added to the ability to comment on them. You can also now easily take and post videos if you have an iPhone 3GS. 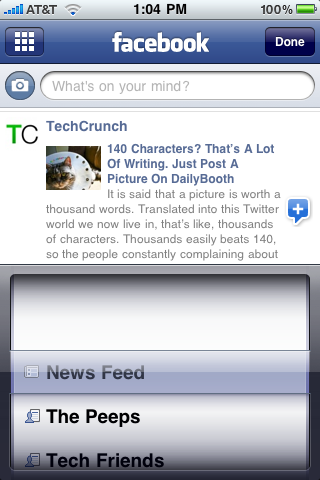 Hitting the “News Feed” button in the upper right hand corner, allows you to sort this feed by the various filters you’ve set up. The “Profile” area is the next button on the main screen. 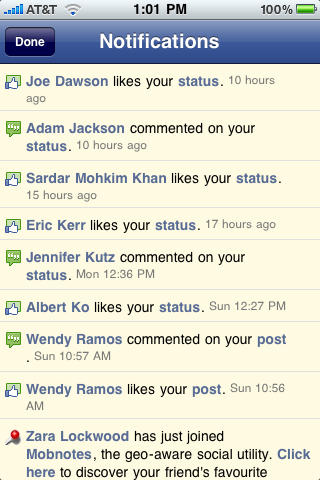 The overall look and feel have been updated, and now also include the “like” and “comment” elements on the Wall. You can also now see your profile pictures. The “Friends” area has been updated to include both Friends and Pages. But a killer feature may be the ability to hit the phone icon and have the option to call or text your contacts. People who consider Facebook to be their contact list, will love this. The “Inbox” is the next main area, and it now features not only new messages, but updates from your groups, and sent messages. But the best thing about this feature is how fast messages load. It’s leaps and bounds better than trying to load messages on the regular Facebook, and I think from now on I’ll simply use the app to respond to any emails I get through it. The “Chat” and “Requests” areas remain largely the same, though both have been cleaned up. The big new feature of this app has to be “Events”. The lack of a way to even see events in the previous version of the app was a major complaint against it — it had people using the web interface to log-in specifically to find events. Now, not only can you see them in the app, you can see details like the address of the event and host of it. And you can RSVP, and you can see who else is attending. With so many Facebook users now using its events feature for social gatherings, it simply made no sense not to have this in there. The Events area also features a “Birthdays” tab to specifically see which of your friends’ birthday is coming up. The “Photos” area now allows you to create new photo albums, and it is significantly easier and more obvious as to how to tag someone in a picture. And at last, Facebook photos allow you to take advantage of the iPhone’s multi-touch to pinch zoom in and out of pictures. The last main page element is “Notes,” which is new. You can see, edit and create new notes from here, just in case your Status Updates don’t give you enough room for all you want to say. Below the main elements is the “Notifications” area that seems to update in near real-time when someone comments or “likes” one of your items or an item you’ve commented on. 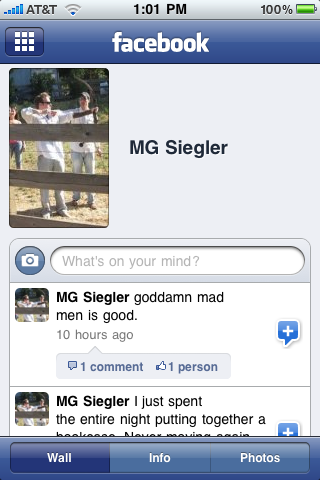 As good as this new Facebook iPhone app is, there are still some missing features. The two biggest ones are Push Notifications and a robust search. Hewitt had mentioned previously that Push Notifications would not be in 3.0, but hinted that they could come in 3.1. He stated on Twitter that with 3.0 done, the work is already starting on 3.1. When we asked him about any new features for that build, Hewitt said he wasn’t ready to comment on specifics yet. But it’s probably a good bet that Push Notifications will be one of them. And earlier today, he also noted that there will be a landscape mode in 3.1. And he’s also noted that videos recorded on the iPhone 3GS don’t yet play in the app because Facebook doesn’t encode them in an iPhone-compatible way. That should change soon too. The bigger omission, as I see it, is the lack of a robust search tool. Facebook recently rolled out the upgraded search functionality on its site, but on the iPhone searching is limited to profiles and pages. Basically, it’s useless, as you can get much of this information from the Friends area. If Facebook is serious about search, it needs to make basically everything that gets updated on the site (allowed for by individual’s privacy settings, of course) searchable on its mobile app in real-time. That would be a killer feature. 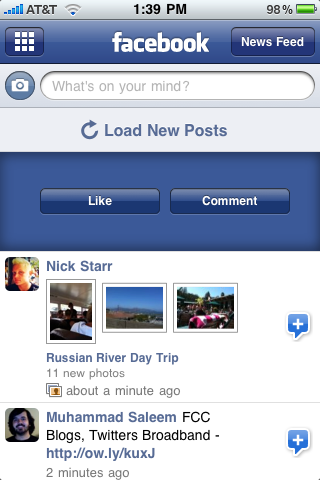 Overall, the Facebook 3.0 iPhone app is a huge step forward as a social tool. In fact, in terms of the data it lets you access, it’s hard to argue that any app is more robust. It’s now basically a way to keep track of and remark about what your friends are up to, an always up-to-date contact list, a picture and video sharer, an inbox, an IM client, and a event coordinator, all tied to over 250 million social users. With the additions of Push Notifications and a better search tool, it will be nearly perfect. And all of these new features wrapped into an app that is even zippier, makes this a great (and free) upgrade. Update: Hewitt has just let us know about another really nice feature. 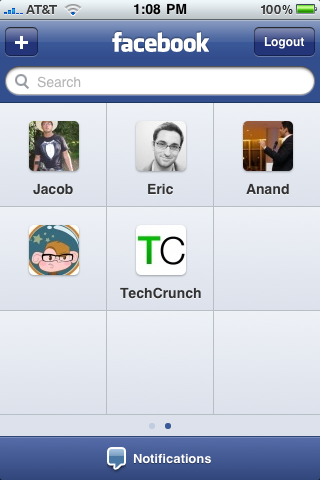 If you tap the Facebook logo, you’ll automatically go back to the main home screen. Tap it again and you’ll return to where you just were. Subtle, but nice feature.